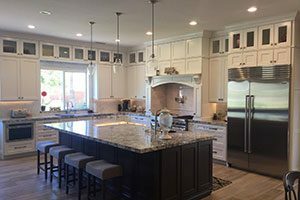 If you love your neighborhood but realize your house simply doesn’t suit your needs anymore, Dream Construction in Las Vegas, Nevada can breathe new life into your surroundings with a complete home renovation. Whether you want to remodel and update the whole interior of your house or start from scratch with a complete renovation to add rooms or even a second story, we can help you plan all phases of your construction project. Turn that empty attic, unfinished basement, or garage into an Entertainment Center for family fun. Add a hobby room with custom built-in shelving that can be converted into a guest bedroom. Choose custom kitchen or bath cabinets and countertops or add a kitchen island to your newly expanded kitchen. The possibilities are endless, and our design-build team will work hand-in-hand with you to arrive at the perfect design solution for your dream home. Feeling cramped in your old house? Add square footage with a room addition or even a full second story add-on. You could even completely reconfigure your existing interior walls to expand your floor plan and create a more open, warm, and inviting living area. Home design styles come and go, and the interior and exterior features of your home may be sadly out of date. Changing out old linoleum or vinyl for more contemporary custom flooring, replacing old Formica countertops with granite or quartz, changing trim or molding, updating windows and lighting, and adding a front porch or deck can add a whole new contemporary feel to your home. Bring your kitchen into the modern age by expanding and reconfiguring the layout to accommodate new appliances such as trash compactors, side-by-side refrigerators, or professional ranges and hoods. Add a beverage center with a wine rack, a pantry closet, a built-in banquette or island for casual family seating. You could even add an extra bathroom or expand your master bathroom to include a relaxing whirlpool bath. Remodeling your home will greatly add to its asking price should you decide to sell in the future. Dream Construction will work with you to ensure that your house remains in keeping with the neighborhood, blending the old with the new to increase its resale value without pricing itself out of the area. Replace outdated heating and air conditioning with state-of-the-art automated HVAC systems, window shades, and solar panels to greatly reduce your utility bills and save precious energy. Before you put up that “for sale” sign, contact Dream Construction to explore the possibility of turning your present home into the oasis of which you dream. From start to finish, we will be at your side, securing all permits and walking you through design, budget planning and all construction phases of your renovation. Contact us today to explore the possibilities that await.